OxyMin® SELO is a broad spectrum antioxidant which enhances immune system response. 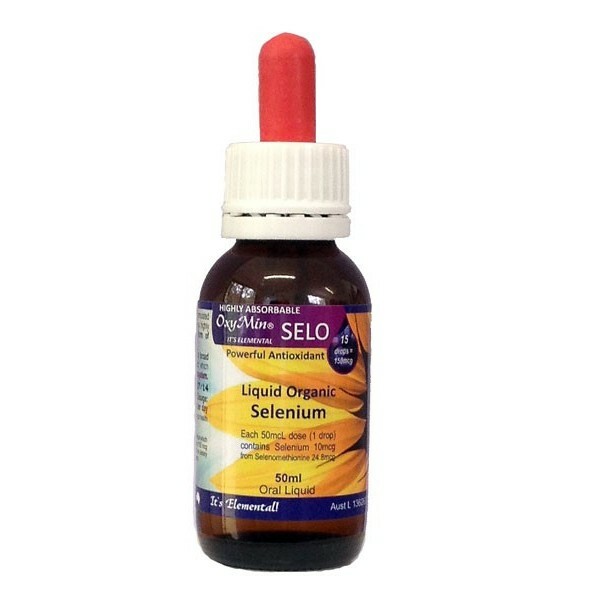 Formulated from selenomethionine, a highly bio-available, organic form of Selenium, OxyMin® SELO provides this essential trace mineral in an easy to take liquid solution. Highly concentrated: Just one drop (50mcL) = 10mcg elemental Selenium! increase sperm numbers and mobility. Recommended Adult Dosage: Take 7 drops (1 drop = 50mcL) twice daily using dropper provided. Can be taken in water or as prescribed by a health care professional. One bottle = over 2 months supply if taken as directed. A daily dose of 150mcg of Selenium from dietary supplements should not be exceeded. Until a few years ago the maximum allowance for selenium in medicines Listed in Australia was 26 mcg of organic selenium (selenomethionine) per daily dose. It has now been agreed to ammend the current dose of selenium to allow 150mcg per daily dose. While this is below the recommended daily limit set by the World Health organisation (WHO) of 400mcg per day, health practitioners Australia-wide have welcomed these changes in order to treat specific conditions w here higher therapeutic doses are required.